STEP ONE Lower spare tire for access to the winch mechanism and frame cross-member. 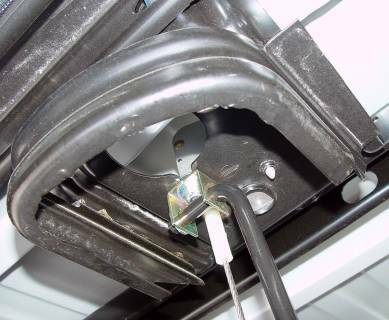 Locate the 1/2" wide slot in the cross-member that extends forward to the white plastic winch cable guide bushing. STEP TWO Use the provided 3/8" hex head bolt, lock nut and two flat washers to attach the U-bracket to the cross-member. Position the U-bracket under the slot in the cross-member with hex head bolt and flat washer upward through the mounting hole in the bracket. Install the lock nut and second flat washer over the end of the threaded end of the bolt. Align U-bracket as shown and tighten lock nut. Place lock bar through both legs of the U-bracket with the grooved end facing toward the left frame rail. Install crimp-ring retainer in the groove and crimp closed with pliers.